Earlier on in my life — from the time I was about fourteen almost until I graduated from college — I was a vegetarian. I know. It seems difficult to believe, given the thrust of this blog, given my posts about pig parts and chicken feet and so forth, given the number of veg-heavy recipes to which I add Thai fish sauce — just for kicks. But it’s true. I ate some seafood for the first couple of years — I don’t think that my mother would have known what to cook, otherwise. But by the time I got to college, I was pretty strict. Eggs and dairy, yes. Other animal products, of whatever kind, absolutely no. Why did I give it up, you ask? Well, Sarah and I gave it up together. We had been kicking the idea around for a little while. She was having some energy-level problems. I desperately missed shellfish. We ate a couple of meals in restaurants over the course of several months in which we there was just a tiny bit of meat, here and there. And then there was Thanksgiving, 2002. Thanksgiving day, we had a giant fight — like disturb-the-neighbors kind of giant — about something that was probably stupid, and definitely not food. We were together in Berkeley for the holiday: neither of us was going home, or seeing family, or anything like that. After spending most of the day mad, there must have been some sort of tentative apology. I don’t remember the details. But what I do remember — pretty vividly — is that almost without a word between us, in the middle of the afternoon, we drove out to the Safeway on Shattuck Avenue and bought whatever turkey was left that wasn’t frozen. I cooked it. We ate it. It was delicious. And that was that. Our vegetarian days ended just in time to enjoy a scattering of the not-so-veg-friendly delights that the Bay Area has to offer before we packed up our U-Haul, hitched it to my poor (now deceased) Toyota Corolla, and moved to Southern Indiana. But just because I left my — um — salad days in the rear-view mirror, there in Berkeley, it does not mean that I left my enthusiasm for meat-free eating, or my sympathy for those who choose not to partake, behind. I was not a vegetarian for political reasons, or for the sake of animal rights. And yet, I recognize that given the horrific conditions of industrial meat production, and given the environmental disaster that is the result, eating less meat is better, and depending on the circumstances, eating no meat at all might be best. That is not my solution. I stand, on this issue, with Michael Pollan. I try my best, where it is possible, to eat only meat the provenance of which I know. At home, our meat comes largely from small producers, or barring that, from humane operations (I often have to take Whole Foods’ word for it on this account). The theory behind this is twofold: 1) ultimately, I really like meat; and 2) while there may never be enough vegetarians in the United States to change agribusiness on a large scale, by voting with our pocketbooks for certain kinds of products over others, we may yet, collectively, be able to do some good. Whether that works or not, I do not know. The no-meat perspective has a lot of merit in my mind as well. What I do know is that in our household right now, while there is a lot of meat, our overall food consumption tilts probably eighty percent toward the vegetable. What I do know is that from my perspective, the best diet is the one with the maximal amount of variation. And what I do know is that, despite my sometime porkatarianism, I am always on the lookout for good veg and vegan recipes that I can rotate into my cooking routine. Which is why I was so pleased, to put it mildly, when friend of the blog and sometime contributor Sharyn mentioned vegan kale pesto on her Facebook. She raved about its virtues. The other posters on her status raved about its virtues. As a lover of bitter greens, I chimed in and asked her if I could steal the idea. And she said: by all means. So I did a little bit of poking around and a little bit of experimentation. My goal, initially, had been to post a vegan and non-vegan version of the dish. But by the time the food processor stopped whirling and I got my first taste, I had changed my mind. 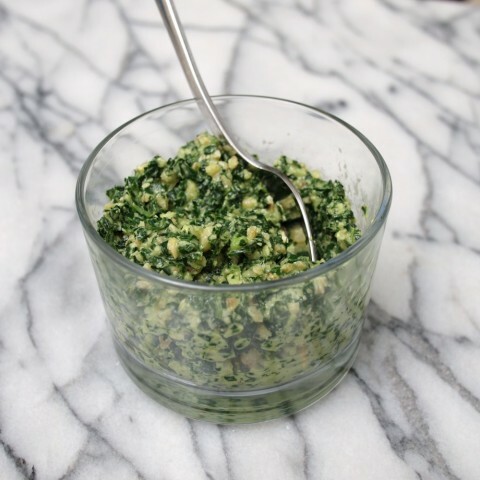 Let me tell you, dear readers: vegan kale pesto, with nutritional yeast (so much better than it sounds!) 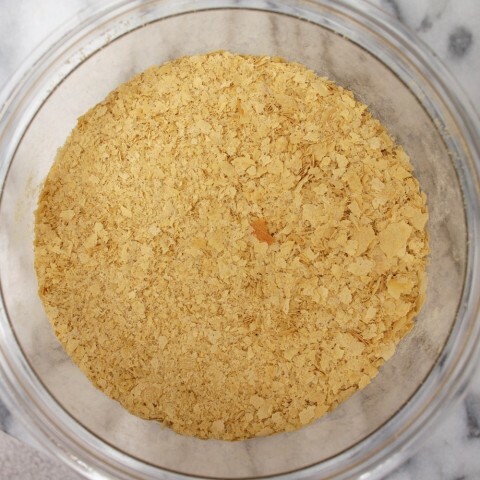 doing the umami work of Parmesan cheese, is so delicious that there is no need for a non-vegan alternative. Go out and get the one ingredient in this that you probably don’t already have at home. It’s cheap. And good. And you definitely won’t regret it. 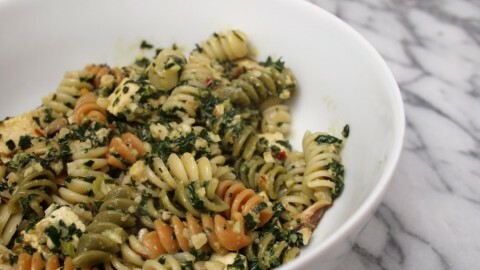 Anyway, here’s how to make it: Vegan Kale Pesto. Blanche and Shock the Dinosaur Kale (drop it into boiling water for 40 seconds, then immediately remove it to ice-cold water to stop the cooking). 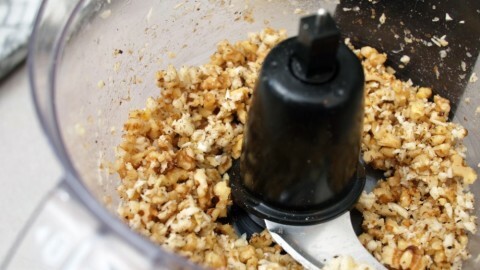 Add the garlic and walnuts to the work bowl of a food processor, and pulse once or twice, just to chop it all up a bit. 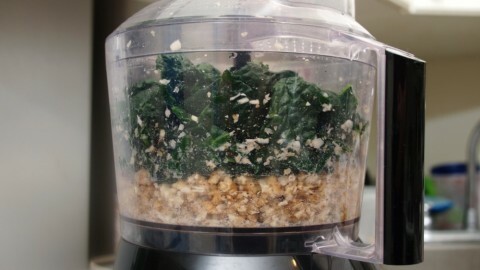 Add the rest of your ingredients, including the kale, and run the food processor until all the ingredients are chopped finely, and the mixture forms a coarse paste. If the pesto seems a bit dry, add another tablespoon of olive oil and a tablespoon of water, and pulse once or twice more to mix. 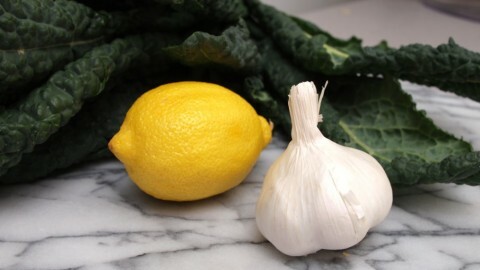 Kale pesto should keep in your refrigerator for a couple of days. But I doubt that it will last that long, once you taste it. I would recommend serving it over pasta, with sautéed extra-firm tofu and mushrooms.